LGBTQ inclusion is something all facets of society should be striving for, the business community included. There are many cultural and corporate benefits of LGBTQ inclusion, with Harvard Business Review reporting that LGBTQ-inclusive workplaces help companies attract and retain top talent, boost their appeal to growing consumer segments and innovate for underserved markets. In recent years, organisations across many sectors have made huge strides in supporting LGBTQ employees and creating an inclusive workplace. However, a recent Stonewall survey of LGBTQ workers in the UK highlighted that there is still much progress to be made: the charity found that more than a third of LGBTQ staff (35 percent) have hidden their sexuality at work for fear of discrimination, while 18 percent have been the target of negative comments or conduct from colleagues in the last year. This has been a particular problem for black, Asian and minority ethnic LGBTQ employees of Britain’s workplaces, 10 percent of whom have been physically attacked by customers or colleagues in the last year. Across Europe, an EU poll from 2013 found that a quarter of the LGBTQ community surveyed had been subjected to attacks or violent threats in the five years prior, with the highest rates in Croatia, Bulgaria and Romania. More recently, the 2018 report from the International Lesbian, Gay, Bisexual, Trans and Intersex Association revealed that many European countries, including those traditionally perceived as frontrunners for equality, are stagnant in their progress on LGBTQ rights. These reports are troubling, but hopefully they will prompt businesses, governments and society more widely to update their inclusion practices and stay vigilant in ensuring workplaces are safe for the LGBTQ community. Internationally recognised events like Pride Month and Transgender Day of Visibility remind us of the importance of fostering fully inclusive workplaces, and this is something I am deeply passionate about as a human resources manager. It was a pleasure to sit on the judging panel for this year’s PinkNews Awards in the UK, recognising the contributions of organisations and individuals that are campaigning for LGBTQ rights at home and abroad. The excellent work by National Trust, this year’s winner of the Amazon-sponsored Third Sector Award, got me thinking about the steps multinational organisations can take to better recognise and support LGBTQ talent. Clear and robust policies should be the starting point, but they are the minimum standard. Much more importantly, businesses should keep an eye on the day-to-day conduct of employees. Employee assessments should also be measured against consistent and objective standards, ensuring that the playing field is even for all. Amazon’s leadership principles set a universal standard that all employees work towards every day. These are the foundation of all employee assessments. Ultimately there is no one-size-fits-all approach to inclusion, but a clear strategy that outlines a non-discriminatory corporate culture and is backed by inclusive policies is key to fostering greater diversity and making LGBTQ employees feel safe. Sometimes known as employee resource groups, affinity groups are voluntary, employee-led groups designed to foster a diverse, inclusive workplace by identifying key values and putting organisational goals into action. These groups also help to foster future leaders and boost employee engagement by giving a voice to specific communities. Earlier this year, for example, Amazon’s UK LGBTQ affinity group, Glamazon, supported the development of new nationwide guidelines on how to support transgender colleagues. Glamazon’s input was invaluable during this process, but affinity groups do more than advise on policy: they engage allies across the business, create fun social occasions, support recruitment and help employers understand diverse demographics and marketplaces. Diversity and inclusion may be good for employee wellbeing and company culture, but they also have a positive impact on a company’s bottom line: McKinsey reported that businesses with a diverse workforce are up to 35 percent more likely to outperform competitors. Therefore, as well as being the right thing to do, promoting diversity is good for business. One of the key ways to promote diversity is to empower and educate managers. As the first point of contact between employees and leadership, it is essential that managers receive cultural sensitivity training to constantly update their thinking. Organisations may undertake this on an annual or quarterly basis. At Amazon, we encourage managers to sign up to our team inclusion programme, a manager-led initiative that enables teams to identify ways to increase inclusion and improve employee wellbeing and productivity. Organisations should also remember that a positive, inclusive company culture begins at the top. It’s important that senior leadership is visible, loud and confident in its support for all employees, including LGBTQ communities. As a powerful symbol of pride among the LGBTQ community, the rainbow flag has long been synonymous with inclusion, diversity and progress. Some companies have adopted simple ways for allies to make themselves visible by using the rainbow to great effect. Inspired by Stonewall’s excellent Rainbow Laces campaign, organisations could make rainbow lanyards and stationery available to anybody who signs up as an ally. Visible, empowered and educated allies will be more prepared to influence others, challenge negative views and support colleagues on a day-to-day basis. One simple but visible change we made at Amazon recently is the option to add preferred pronouns on your personal internal directory page. If they choose to do so, any employee can display their preferred pronouns, I’ve been encouraged by the number of senior leaders in the UK demonstrating support by doing so themselves. In truth, no amount of training, awareness or advocacy can replicate the lived experience of a member of the LGBTQ community. Those experiences vary hugely and they all need to be taken into account when managing employees. No matter how diverse and forward-thinking, organisations and individuals may still have blind spots to sensitive issues that mean even well-meaning interactions can come across as negative, prejudiced or downright rude. For this reason, taking the time to engage with the community is invaluable. That means taking the time to listen, learn and educate others. Sometimes it means challenging regressive views head-on. 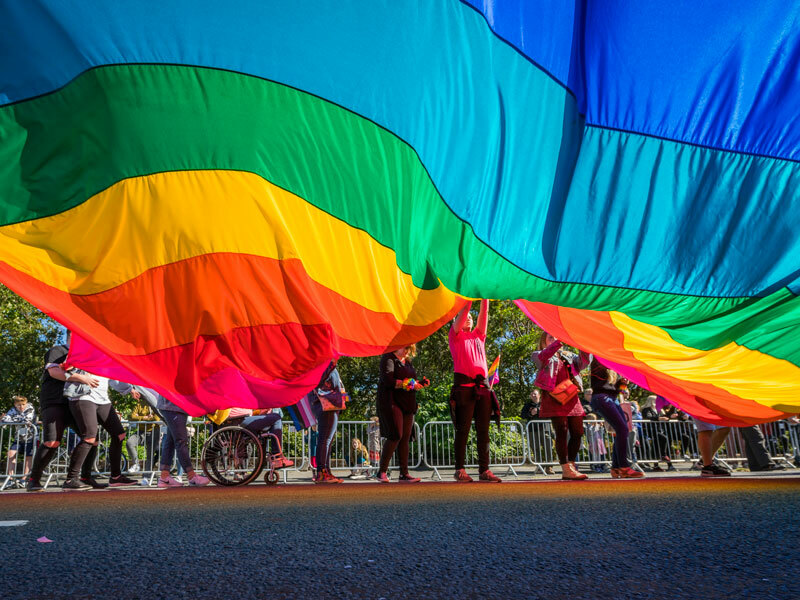 Nationwide events like LGBT History Month are a great opportunity to engage with this community, but it can be disappointing to see brands wave a rainbow flag at a time when it suits them without backing up that support with long-term policies. As such, engaging with the LGBTQ community beyond obvious events can send a strong message about a business’ commitment to diversity.